Is qsphere an actual term representing 5 qubits? I'm a total beginner, I've been brought here by the featured stackoverflow blog post so I started studying. At first I thought that, besides qubits, which can be in a superposition of 0s and 1s, there's also a qsphere, which can be in a superposition of 5 zeros and 5 ones, when in fact it's just 5 qubits. So when we say a qsphere, it's known to be 5 qubits? The qsphere is a way of representing multi-qubit states. So it could be used for 5 qubit states, but it could also be used for any other number. It could also be used for just one qubit. But in this case it is important to note that the single qubit qsphere is not the same as the Bloch sphere, which is our standard way of representing single qubit states. Instead, the qsphere is essentially a more visually appealing version of a histogram. It was introduced by IBM as a visualization for the Quantum Experience, but doesn't seem to be used so much by them any more. Here the bit string 0000 comes out with probability $0.5$, and so on. On the qsphere, this would be represented by four points: one for each of these non-zero probabilities. The latitude of the points depends on the number of 0s and 1s in the bit string. Our result that has all 0s would be at the north pole. Our 0111, with mostly 1s, would be near the south pole. The two results 0101 and 0011 that we have in our example would be at the equator. The probability is represented by the strength of the line. The two with probability of only $0.125$ would have quite faint lines. The one with probability $0.5$ would have a much thicker line. Those with $0.25$ would be somewhere in between. So far, we have represented all aspects of the histogram, but have not included any phase information that the state might also have. This can be encoded using the colour of the points. The sphere then has all the information on the multi-qubit state. To see why it is not the nicest visualization there is, imagine performing a Hadamard gate. This transforms latitude and longitude information into colour, and vice-versa. Despite being a simple gate, it would have a very complex effect. But then again, what visualization of many qubits doesn't have its weaknesses? If it was easy to visualize them, it would be easy to simulate them. And then we'd have no need to build quantum computers. If it is, it is not widely used. I claim this because I looked around in arXiv, a repository of electronic preprints of research articles, and found nothing. 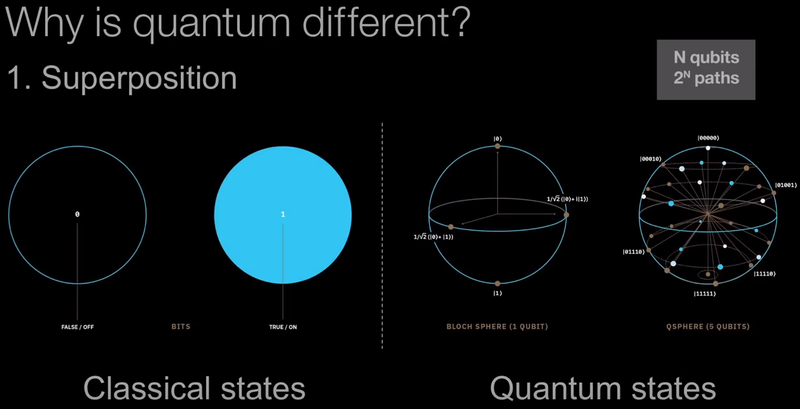 There are many other units of quantum information than just qubit though. All of the following appear at least occasionally in the relevant literature. Qubit has a computational basis of two states and can be implemented by a two-level quantum system. Qutrit has a computational basis of three states. Ququart is a (rare) term used by some, and it has a basis of four. Qudit is a common term. It is the $d$-dimensional generalization of a qubit. Often $d$ is left unspecified and these are used when comparing the effect of using different values of it. Qumode is again a bit less often used term in continuous-variable quantum computing, where now, informally speaking, the basis has infinitely many elements. Use of the term “dimension” in this description of Simon's algorithm? Do any specific types of qudits other than qubits and qutrits have a name?